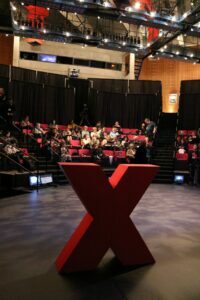 The first TEDxBellevueCollege was held in the Carlson Theatre yesterday, and streamed live in simulcast rooms on campus. The event turned its focus to the theme of ‘perception’, with topics ranging from the importance of silence in healing communities, why it’s never too late to quit a successful career in corporate America to start a rock band, and how an understanding of neurodiversity can help institutions develop the unique potential of each member in their organization. One of the speakers, Paula Boggs, brought her life experience to the table as a former Starbucks executive and lawyer who found the courage to be her true self, trading the corporate world for her dream of starting a bluegrass band. She has now released a full album and an EP, and tours the country with her band. Kyle Grant Wilson, a Navajo poet, educator at Arizona State University, and expert in indigenous rhetoric, travelled all the way from Arizona to speak on the public’s perception that the effects of colonization aren’t still being felt by indigenous communities. Audience members were encouraged to explore their own perceptions with a series of interactive displays including a six-foot poetry board, Microsoft HoloLens, and cards with messages written in different languages about perceptions that would only be revealed in English with a black light. “I liked a lot of what TED has been doing, so actually coming out and seeing one of their shows is something I’ve been really wanting to do,” said BC student Andrew Peterson. Originally scheduled for Feb. 7, the event was postponed due to record snowfall and the campus closure that day. Over 600 people applied for one of the coveted seats at TEDxBellevueCollege, which was limited to 100 for the live experience for its inaugural event. “We were thrilled with the response, and to anyone who couldn’t come, know that we’ll have the videos up for viewing as soon as possible.” said Alonda Williams, TEDxBellevueCollege founder and organizing committee member. The independently produced event, operated under a license from TED, was organized by community volunteers and is aimed at creating dialogue as well as giving people a forum to share their passions, ideas and experiences. For more information or photos about the event, visit www.bellevuecollege.edu/tedx. TED is a nonprofit organization devoted to Ideas Worth Spreading, usually in the form of short, powerful talks (18 minutes or fewer) delivered by today’s leading thinkers and doers. Many of these talks are given at TED’s annual conference in Vancouver, British Columbia, and made available, free, on TED.com. TED speakers have included Bill Gates, Jane Goodall, Elizabeth Gilbert, Sir Richard Branson, Nandan Nilekani, Philippe Starck, Ngozi Okonjo-Iweala, Sal Khan and Daniel Kahneman. TED’s open and free initiatives for spreading ideas include TED.com, where new TED Talk videos are posted daily; the Open Translation Project, which provides subtitles and interactive transcripts as well as translations from thousands of volunteers worldwide; the educational initiative TED-Ed; the annual million-dollar TED Prize, which funds exceptional individuals with a “wish,” or idea, to create change in the world; TEDx, which provides licenses to thousands of individuals and groups who host local, self-organized TED-style events around the world; and the TED Fellows program, which selects innovators from around the globe to amplify the impact of their remarkable projects and activities. We're always looking for story ideas. Submit yours here if you have something newsy that you'd like considered for a press release, article, or social media post. The Bellevue College Experts Guide is designed to help print and broadcast media reporters take full advantage of the wealth of expertise available from BC faculty and staff. 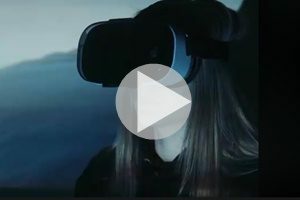 Why is Virtual Reality Such a Big Deal?